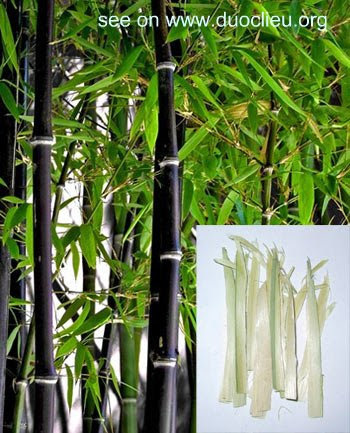 Part Used & Method for Pharmaceutical Preparations: After the outside green skin has been removed, shavings are taken from the outer part of the bamboo. This can be done all year round. Meridians: Lung, stomach and gall bladder. 1. Cough due to heat in the lungs manifested as cough with yellow thick sputum: Bamboo shavings (Zhuru) is used with Scutellaria root (Huangqin) and Trichosanthes fruit (Gualou). 2. Mind disturbed by phlegm-heat manifested as irritability, insomnia, palpitations, stifling sensation in the chest and cough with yellow sputum: Bamboo shavings (Zhuru) is used with Immature bitter orange (Zhishi), Tangerine peel (Chenpi) and Poria (Fuling) in the formula Wendan Tang. 3. Nausea and vomiting caused by heat in the stomach: Bamboo shavings (Zhuru) is used with Coptis root (Huanglian), Tangerine peel (Chenpi), Pinellia tuber (Banxia) and Fresh ginger (Shengjiang).